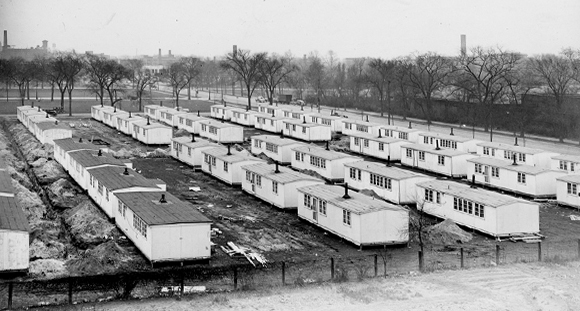 After World War II, veterans and their families lived in tiny, uninsulated houses—and felt grateful to have them. 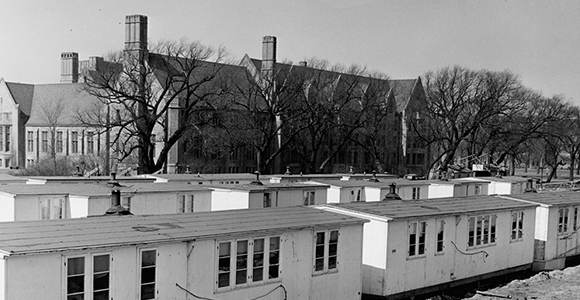 The end of World War II prompted an influx of applications to the University of Chicago as returning veterans pursued their education with support from the GI Bill. 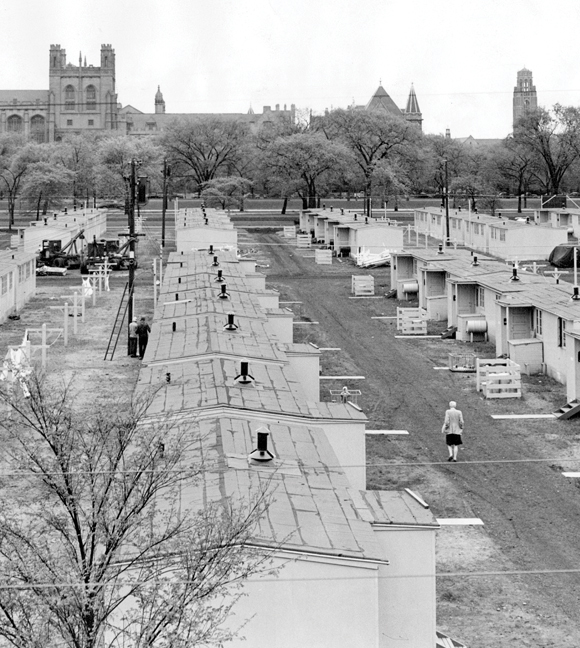 In 1946, to meet growing demand for housing, the University used converted barracks to erect 190 temporary houses (known as “prefabs”) for married students along the Midway and next to Burton-Judson Courts, where the Laird Bell Law Quadrangle now stands. Rent was $45 per month including utilities. Veterans received a $90 monthly stipend through the GI Bill, which was later raised to $120. Many men and women worked additional jobs to make ends meet. 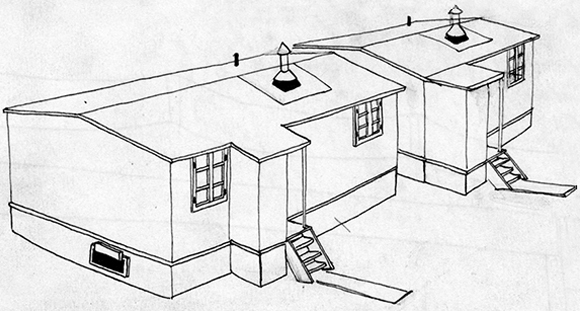 The prefabs had no insulation. Despite their large, coal-burning stoves, ice often formed indoors during winter. In summer residents placed sprinklers on the roofs to cool them down. 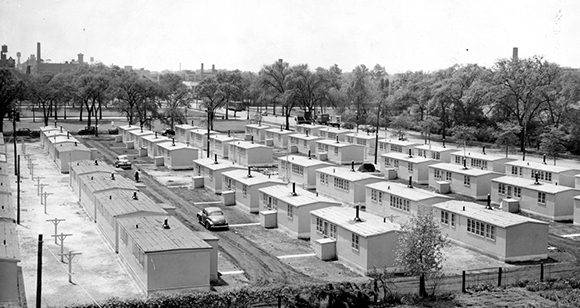 Each unit included a bedroom—two bedrooms for families with two or more children—and a “great room” furnished with a wooden table, four chairs, and a couch that could be converted into a single bed for company. 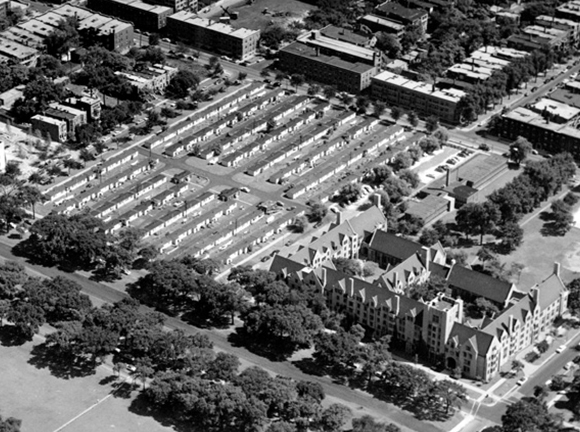 Kitchens were equipped with plywood cabinets, an old-fashioned icebox, and a two-burner hot plate with a removable Dutch oven for baking. Master bedrooms came with two twin beds. Residents were responsible for furnishing the children’s bedroom. Residents socialized over picnics and games of bridge with neighbors. Wives often met at the “washhouses” while doing laundry and shared childcare responsibilities.